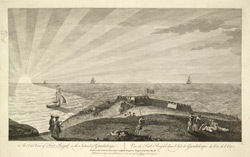 A view overlooking Fort Royal on the island of Guadeloupe, drawn by Lieutenant Archibald Campbell (1769-1783). Campbell joined the army as an engineer and took part in a number of expeditions to Martinique, St. Lucia and Grenada. He was in Guadeloupe during the English occupation of the island from 1759 to 1763 and was later promoted to General. Fort Royal is situated on the west coast of Basse-Terre, the larger of the two islands which make up Guadeloupe.